‼️‼️ IMPORTANT ANNOUNCEMENT ‼️‼️ Due to unforeseen scheduling conflicts, our screening of BAD TIMING will now be on the 22ND JANUARY. Screening is still being held at St. Paul's and doors will open at 7.30 for an 8pm start. As always, screening is free to members and £5 for non-members. We apologise for any inconvenience but still hope to see lots of you there on the 22nd nonetheless! With a sly nod to Vertigo Roeg’s Bad Timing is one of his most complex, elusive and dark movies. 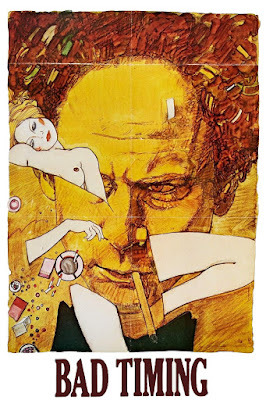 In typical Roeg fashion he builds a thousand piece jigsaw from its apparently simple story of a passionate affair gone wrong between two Americans - Alex and Milena - in Vienna. Seen in flashback through the prism of the girl's attempted suicide, their affair expands into a labyrinthine enquiry on memory, love and guilt as the free spirited Theresa Russell's cold psychoanalyst lover (Garfunkel) himself falls victim to the cooler and crueller investigations of the detective assigned to her case - Keitel in visionary form as the policeman turned father-confessor. Fate is at the heart of all the director’s films. And none more so than with Bad Timing. There is a claustrophobic sense of inevitability to Alex and Milena’s relationship. On meeting him for the first time at a party, she even says: ‘If we’re going to meet, it might as well be now.’ The characters are on an unstoppable course, swerving towards emotional oblivion. The sensation is like a looped dream. The viewer can’t help but want to reorganise the edited scraps in a desperate bid to change the unavoidable outcome in some way. Once described by Mark Cousins as a ‘Douglas Sirk melodrama attacked by Edward Scissorhands’, it goes someway in describing the lacerating and intriguing journey the film takes us on. Branded "a sick film made by sick people for sick people" by its own distributor, the Rank Organisation, the film polarised critics and was given an X Rating in the USA. It was effectively shelved for 25 years before it was released on DVD in 2005. But perhaps it was simply ahead of its time, or maybe the film itself suffered from bad timing. Multi layered, compelling and provocative Bad Timing is a fitting tribute for its former cinematographer (Far From the Madding Crowd, Fahrenheit 451) turned one of cinema’s most visionary, bold and innovative auteurs. We at WFC highly recommend it! The film is free to Worthing Film Club members (£30 a year - email Caroline at worthingfilmclub@gmail.com to join) or £4 for a ticket, cash on the door. For more details on membership, see here.